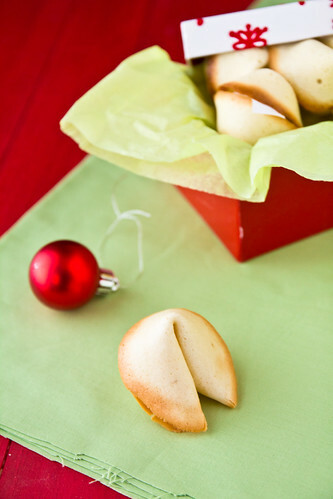 These fortune cookies were one of three kinds of cookies that I made for a cookie exchange last week. 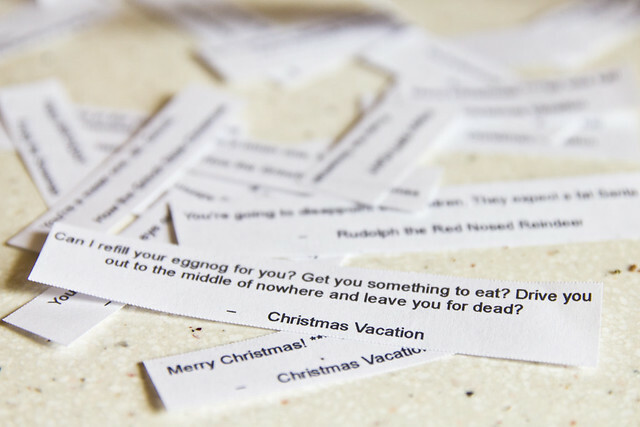 But instead of a small slip of paper containing a fortune and lottery numbers, we stuffed them with silly quotes from some of my favorite Christmas movies – an idea that I totally swiped from Amy (she made red and green ones!). Things like, You’ll shoot your eye out! and Of all the Charlie Browns in this world, you’re the Charlie Browniest. Or Clark: Can I refill your eggnog for you? Get you something to eat? Drive you out to the middle of nowhere and leave you for dead? They ended up being a ton of fun to put together. But it didn’t start out that way. It was slow. Tedious. Painful. And I was kicking myself for choosing homemade fortune cookies over sugar cookies. The first dozen took me 45 minutes. At least. And cost me most of my fingerprints. You can only do, at most, 4 cookies at a time because you have to handle the cookies while they’re still piping hot (goodbye fingerprints) – they begin to harden really quickly as they cool. And you can’t shape hard cookies. The first two pans had 1 cookie each. Then I moved up to 2. The texture was perfect – the cookies are crunchy and sweet. I used a little more vanilla than the original recipe called for and added almond extract. Because everything tastes better with a little almond extract. Some of the cookies got a dip into some vanilla candy melts and a sprinkling of red, white, and green sprinkles. The recipe below is a quadruple batch (I needed 2 dozen cookies for the cookie exchange) and then I whipped up another single batch so we’d have a few on hand at home. There’s no way they make it through the weekend. 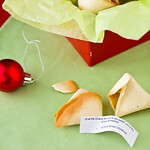 Make your own fortune cookies for Christmas - or any other holiday - complete with custom fortunes! Whisk egg whites and extracts together until light and foamy. Whisk in flour and sugar and mix thoroughly. 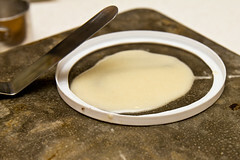 The batter should be like a thin pancake batter - when you raise the whisk from the bowl, the batter should disappear as soon as it hits the surface. I had to add 2 tsp water to get it thin enough. Lightly mist the backside of a baking sheet with baking spray. 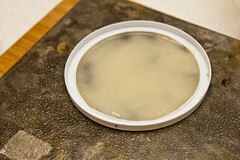 Drop a heaping spoonful of batter onto the baking sheet and spread it around evenly into a 4-inch circle (A template made from a sour cream lid and an offset spatula made this job easy). Repeat to form 4 rounds of batter. Bake 4-6 minutes, just until the edge of the cookie browns 1/4-inch around. Remove from the oven and work quickly. 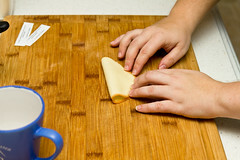 Using a spatula, transfer one round to your cutting board, placing it top-side down. 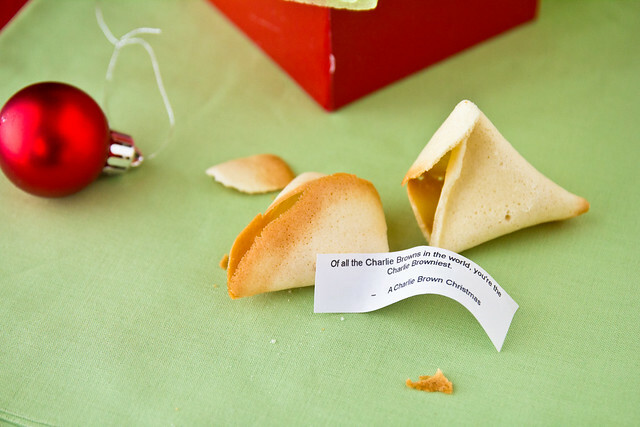 Place the fortune into the center, and fold the cookie in half. 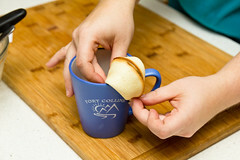 Pick the cookie up and place the folded edge onto the rim of a mug and gently pull the corners down. 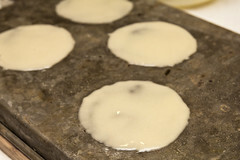 Put the formed fortune cookie into the well of a cupcake pan - this will hold the shape until the cookie cools and hardens completely. Repeat with each cookie and batter until finished. Cookies should be stored in airtight container after cooling completely. Your cookies came out awesome! Great idea to make a template to make the cookies the same size! I was having trouble with that one while making them! Yours turned out so great! I made these last year and I struggled with them, but managed to get a few good ones. These are absolutely adorable, Shawnda! Whoever received these cookies in the cookie exchange must be really lucky!! They look so cute! I’m always looking for ways to use egg whites, since there are about 20 of them in my freezer at any given time 🙂 These are so cute, love them! This is SUCH an adorable idea and I love how multi-purpose they are! I’m convinced that just about any party could benefit from some fortunes. Yours turned out amazing compared to my first two batches, fingers crossed for batch 3! I think I am going to make these for Valentines Days and put some cute little fortune in them.